The January / February 2019 WFAN Morning Show ratings are the lowest the station has had in 20 years. Gregg Giannotti is not appreciated by co-workers. Boomer Esiason and Gregg Giannotti were in 7th place Men 25-54 and under - a 5 share. A source believes that they are the lowest rated show on the station for 6 straight months. Another source, commenting on Gregg Giannotti's 'talents' said simply, 'yeah, no.' Adding, "There's a reason you've now had at least two people complain to you about him. 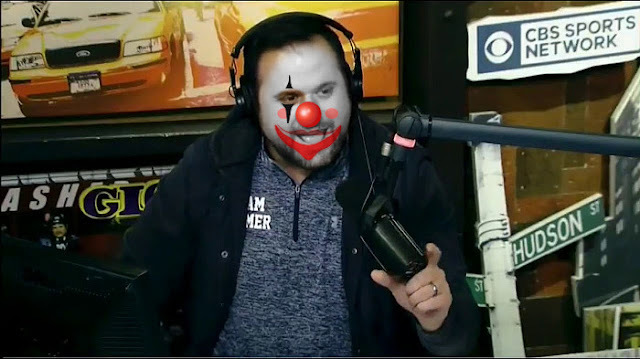 He is not appreciated as a co-host. Not one bit." Let's sum up how bad it's really gotten over there. WLTW 106.7 Lite fm, New York's Best Variety..., has almost double their listeners. At the end of the day people would rather hear Kenny G then listen to Boomer & Gio, and all that other stuff. And now? Gregg Giannotti called Le'Veon Bell an idiot while Boomer Esiason guffawed like a buffoon.